Offices available in this mid 1900’s building over 2 floors as one or separate. 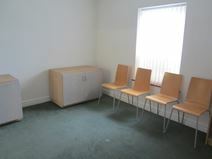 Ground floor office comprises three separate rooms with disabled toilets, front and rear entrance door and parking spaces. First floor office consists of one large room with access to the main office, toilets and kitchen area. There is a main entrance lobby at the front of the building. Located 2 minutes’ from Rainhill station with mainline trains running directly to Liverpool & Manchester. M62 within 1 mile with a short walk to various shops, post office and supermarket. Directly outside is a bus stop with regular service to Liverpool every 10 minutes’. A selection of offices is available to let in this prestigious building, close to the motorway network, well connected to the surrounding cities and served by numerous bus routes. These offices are provided with a full range of facilities and services, including 24/7 access and security system, reception services, the latest IT and telecommunication solutions, meeting rooms and kitchens.